The self-proclaimed ‘toughest sheriff’ in America is in court for contempt this week after acknowledging he violated a judge’s orders in a racial-profiling case and failed to change policing practices in his office. A hearing concerning Sheriff Joe Arpaio, the 82-year-old top cop in Maricopa County, Arizona, was scheduled to begin in US District Court in Phoenix on Tuesday this week. It’s expected to last for four days. The controversial anti-immigration official might take the stand as early as Wednesday, according to local media. At issue is whether Arpaio willfully disobeyed the orders of US District Judge Murray Snow, who ruled in 2013 that the sheriff had racially profiled the Latino drivers in Maricopa County. As punishment, Snow ruled that that the sheriff and his administration had to reform the office’s policies. Nearly two years later, though, Arpaio and company are alleged to have fallen short of the court’s orders. Arpaio has already admitted that he disobeyed an order from Snow to curb Maricopa County’s immigration enforcement practices, the Associated Press reported this week, and has accepted responsibility for failing to surrender traffic-stop tapes pertaining to instances where Sheriff’s Office personnel pulled over Hispanic drivers, contrary to the court’s requests. Both Arpaio and Deputy Chief Jerry Sheridan, the county’s number two cop, have told the court that they’d personally contribute a combined sum of $100,000 to a civil rights organization and issue a public apology in order to resolve the case. Additionally, the Sheriff’s Office has offered to settle to the tune of $350,000 in taxpayer funds. While Snow didn’t shun their offer completely, however, the judge has refused to heed requests to call off the hearing. “I think for much of this process Arpaio has tried to wipe his hands of any wrongdoing. So we want to get to the bottom of this and what we expect to show is he knew he was deliberately disobeying this order,” Alessandra Soler, the executive director of the American Civil Liberties Union of Arizona, told KPHO News. The ACLU is representing the plaintiffs in the case. "We don't know the full story of how the violation of the court orders has happened — that has not come out yet," Cecillia Wang, another member of the ACLU legal team, told the Arizona Republic. "Without hearing that evidence, we don't know yet what a remedy looks like." ‘Sheriff Joe’ has routinely made headlines throughout his 22-year career atop Maricopa law enforcement for a slew of contentious policing techniques. According to AP, county taxpayers have already footed legal fees on behalf of the sheriff’s defense amounting to $6.8 million, as well as having spent another $2.6 million on a court-ordered staff to monitor Arpaio’s office. "This is a man who has flouted the law so notoriously over 20 years, and yet he appears to be unscathed, although we taxpayers have paid a price for it," Michael Manning, an attorney who has successfully sued Maricopa County for millions of dollars over deaths that occurred in Arpaio’s jails, said of the sheriff to AP. At the conclusion of this week’s hearing, Snow will decide if Arpaio and four current and former officials should be held in contempt for violation the 2011 injunction that barred the Sheriff’s Office from continuing to practice anti-immigration policies deemed unlawful by the court. All five are listed as potential witnesses in the matter. 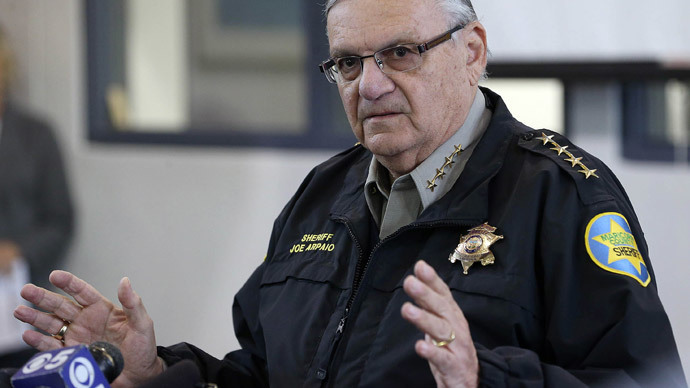 After, Snow may elect to launch a criminal contempt case against Arpaio, the likes of which could end with the sheriff serving jail time if he’s convicted.